A photograph of sociologist Benoy Kumar (B.K.) Sarkar that appeared in the March-April 1917 issue of The Hindusthanee Student. Photograph of the Iowa Chapter of the Hindusthan Association of America from the May 1913 issue of The Hindusthanee Student. Photograph of the members of the Illinois chapter of the 1914 Hindusthan Association of America from the September 1915 issue of The Hindusthanee Student. Photograph of Jagadish Chandra Bose at the home of Edwin Herbert Lewis in Chicago from the September 1915 issue of The Hindusthanee Student. Photograph of the Seventh Session of the International Hindusthanee Students' Convention, from the September 1915 issue of The Hindusthanee Student. India Block in the P.P.I.E. The "India Block" at the Panama Pacific International Exposition held in San Francisco in 1915. Photograph of the members of the California Chapter of the Hindusthan Association of America, from the October 1915 issue of The Hindusthanee Student. Photograph of the Illinois Chapter of the Hindusthan Association of America from the November 1915 issue of The Hindusthanee Student. Photograph of N.S. 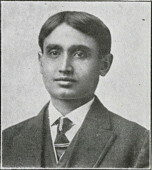 Hardikar from the November 1915 issue of The Hindusthanee Student. Photograph of Sudhindra Bose from the November 1915 issue of The Hindusthanee Student.